Welcome to the University of Waterloo! The University of Waterloo and the Faculty Association are pleased to host a New Faculty & Family Welcome Dinner on Friday, September 22, 2017, at the University Club. Come in your casual attire to experience a different side of UWaterloo’s fine-dining venue! Enjoy good food, get to know other new faculty members and their families, have a chat with the University President and Provost, and meet the President and Board members of the Faculty Association. Children of all ages are welcome, and will be entertained by a wide variety of supervised fun and activities—from carnival games and crafts to movies and video games! Family of one, or don't have family here in town? That's good too! There will be plenty of socializing with other adults. The registration form will prompt you to add your guests, if any, to your ticket, and to tell us about food allergies and other accommodations that you or your guests require. You do not need to download or print your ticket. If you have any questions about the registration process or the event, please email laura.mcdonald@uwaterloo.ca. The event begins at 5:30 p.m., with dinner served at 6:00. The evening will officially wrap up at 8:30. You will find complimentary parking available adjacent to the University Club. 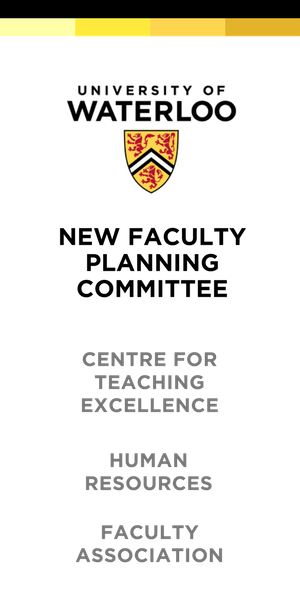 A collaboration between the Centre for Teaching Excellence, Human Resources, and the Faculty Association.